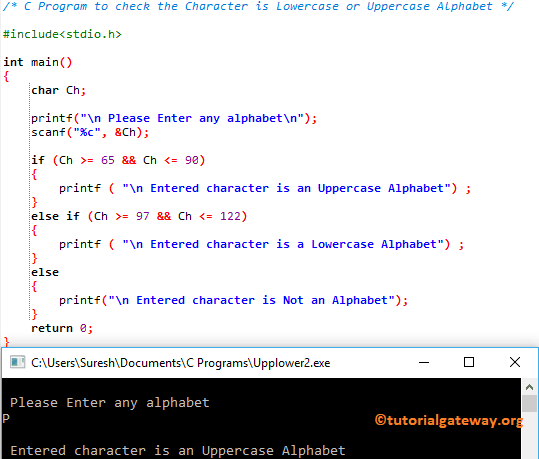 In this article, we will show you, How to write a C Program to Check the Character is Lowercase or Uppercase Alphabet using built-in functions and ASCII codes. TIP: In C Programming, there are built-in functions in <ctype.h> header file called isupper, and islower. You can use these functions to check whether the character is a lowercase alphabet or uppercase alphabet. In this program, we are not using isupper or islower function. Instead of them, we are directly placing alphabets inside the If Statement. In this C program we are using the ASCII codes to check whether the Character is an Uppercase alphabet or lowercase alphabet. I suggest you to refer ASCII Table article to understand the codes.